These two salad greens ought to be more widely grown than they are, and are subject to a lot of naming confusion. Chicory (Cichorium intybus) is a short-lived perennial, while endive (Cichorium indivia) is a biennial somewhat resembling lettuce. They are closely related, but the endive is grown as a leaf vegetable, while only some chicories are grown that way. One form, called witloof, or Belgian endive, is grown as a root crop and then forced in darkness to produce edible buds. We place each in our rotation accordingly. All are cool-weather plants, and are grown as spring or fall crops. 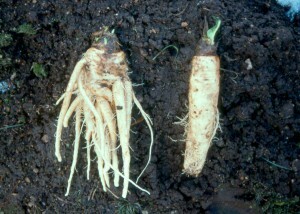 Spring endive can be direct-sown as soon as the ground can be worked. Set the seed 1/4 to 1/2 inch deep in rows two feet apart and thin after emergence to eight to twelve inches between plants (depending on the cultivar). You can also start from seedlings and set out three-week-old plants in the garden at the same spacing, either in rows, or equidistant in beds. I grow endive just like lettuce; it is subject to many of the same problems, but is generally hardier. Endive is a bitter plant by nature, and most gardeners will want to blanch the heads before harvest. Perhaps the simplest way is to wait until the heads are the size you like—and the weather is dry—then gather up each head with one hand and slip a rubber band a third of the way down over the head. That will hold the leaves upright and, after seven to ten days, blanch the inner part of the head. If rainy weather arrives, remove the bands or the heads may rot. Cool weather also tempers the flavor of endive, so for the very best crops combine a fall growing schedule with a week or two of blanching. Fall crops should be sown about seventy to ninety days before the first fall frost. They may need some help to germinate in warm soil; we sow the seed, water thoroughly, and then lay a 2¥6-inch board over the row to insulate it from the sun. As soon as the seed germinates we remove the board. Radicchio, the beautiful burgundy-leaved, white-veined salad ingredient seen in expensive gourmet shops, used to be a difficult crop to grow in America, but with the introduction of new Dutch cultivars over the past few years, it can now be grown just like endive. Only about 75 to 80 percent of the heads will form properly, though, so be sure to plant a few extra. You can tell when the heads are ready by thumping or squeezing. They should be firm, but not hard. The exterior will be green, but once the outer leaves are removed you find the characteristic bright burgundy inner heart. There are also more exotic forms, like the mitre-cap shaped Treviso types and the variegated varieties from the Castelfranco region of Italy. Radicchio can also be grown and forced like Belgian endive, which is another member of the same species. Belgian endive is a salad crop that is grown first as a root crop, stored for a few months, then forced to send out new shoots which are harvested for midwinter salads. Direct-seed sixty to ninety days before the first fall frost, 1/4 to 1/2 inch deep in rows eight to twelve inches apart (add another foot between rows if you want a path). Thin eight to twelve inches apart in the row, and allow the plants to grow for the summer, removing any seed stalks that may form. After the first frosts have slowed the growth of the plants, carefully dig the roots and let them dry for a day in the open; then cut off the tops an inch or so above the crown. Select uniform, well-shaped roots eight to twelve inches long and about an inch across at the crown. Smaller roots will not produce vigorous sprouts, and larger roots may produce multiple sprouts instead of a single, full-size one. Store the roots in damp sand in the root cellar or an underground pit, where they can be kept just above freezing. After a month or so of curing, remove enough from storage to fill a one-foot-deep flowerpot with roots, tightly packed shoulder to shoulder, standing upright. Put the pot full of roots in a totally dark location that has a constant 50˚ to 60˚ F (10˚ to 16˚ C) temperature, water enough so that the bottom of the roots are just barely under the water (use a tray under the pot), and wait three weeks. Sprouts will form and can be cut just above the crown and used for salad; strong roots will produce three crops before needing replacement. If you don’t have a dark spot in which to force Belgian endive, you can rig up a support with bent coat hangers and cover the flowerpot with a black plastic garbage bag. Be sure to poke a few holes in the bag for ventilation or the sprouts may rot. Many people do this under the kitchen sink. Some of the other chicories you might want to try include Spadona, Ceriolo, and Radichetta. They can either be sown in late summer for spring harvest, (yes, they are winter-hardy even here in Vermont), or direct-sown in early spring and harvested at the seedling stage. Either way, blanching will temper the bitter flavor if it is too strong for you. Blanching is easiest on the summer-sown, spring harvest schedule, because as soon as the plants begin their regrowth in spring you simply place a fiber nursery pot over them, and harvest a week to ten days later. My favorite endives are the small, thin-leaved ones known as frisée in Europe. Très Fin Maraichère and Fin des Louviers are two of the originals, and many new descendants of these, like Galia and Tosca, have been developed; look in the catalog description to see if they are listed as a forebear of the cultivar you are considering. Broader-leaved endives that are more resistant to fall weather include Salad King and Frisan. 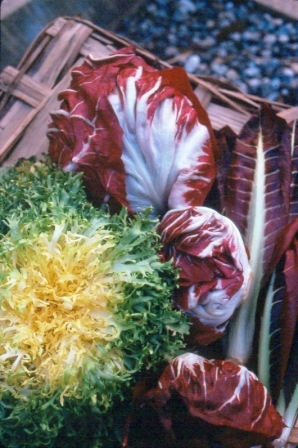 The best radicchio cultivars are Dutch, and there is getting to be a full range available. For ball-headed Chiogga or Verona types try Indigo, Augusto, or Medusa. The elegant, pointed Treviso types are a bit more difficult to grow, but new cultivars like Fiero and Nerone should work well. The two best available Belgian endive cultivars for home gardeners are Flash and Toner hybrids. Some of the other chicories you might want to try include Spadona, Ceriolo, and Radichetta. They can either be sown in late summer for spring harvest, (yes, they are winter-hardy), or direct-sown in early spring and harvested at the seedling stage. Either way, blanching will temper the bitter flavor if it is too strong for you. Blanching is easiest on the summer-sown, spring harvest schedule, because as soon as the plants begin their regrowth in spring you simply place a fiber nursery pot over them, and harvest a week to ten days later.